Venezuelan President Hugo Chavez has signed a series of energy co-operation agreements during a visit to Ecuador. They include the refining of up to 100,000 barrels of Ecuador's crude oil a day in Venezuela, which Quito says will save it more than $300m a year. The deal is likely to raise concerns in the US over the growing regional clout of Mr Chavez, who has strained ties with Washington, correspondents say. Ecuador has been portraying Mr Chavez's visit as technical, not political. Ecuadorian President Alfredo Palacio's secretary said Quito was not interested in joining Venezuela's energy alliance aimed at challenging Washington's economic clout in the region. But whenever Mr Chavez travels, Washington watches him very closely, the BBC's Daniel Schweimler says. He constantly criticises US policy in the region and has found firm allies in Cuba's Fidel Castro and Bolivia's Evo Morales among others, our correspondent says. His visit to Ecuador comes several weeks after Quito had thrown out the US oil company Occidental Petroleum, accusing it of breaking trade rules. That dispute provoked strong criticism in the US and has put in doubt the future of a free trade agreement the two countries were negotiating. But it is just the kind of move Mr Chavez would support and it also won widespread approval in Ecuador, especially among indigenous groups and workers, our correspondent says. The Ecuadorian foreign ministry has issued a statement saying that the Venezuelan president's visit is much more technical than political. The statement said they were trying to build integration on the continent and not form any kind of anti-US access. Both Ecuador and Venezuela are major oil producers. Ecuador wants Venezuela to refine its crude oil at a discount and then help it to build its own refinery. Ecuador has scarce refining capacity and imports petroleum-based products, principally from the US. 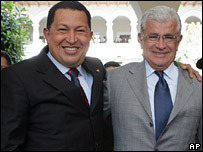 However, the exploitation of Latin America's energy resources is a burning issue in the region and any visit by President Chavez is unlikely to be seen as purely technical, our correspondent says.